Mah Sing Group Bhd, the country's fifth largest property developer by revenue, plans to launch the "Icon City" in Selangor, its biggest commercial development thus far, which has a gross development value of over RM1.5 billion. The project, which will be developed in phases, is located on 7.93ha site in SS8, Sungei Way, a site formerly occupied by Matsushita Group of Co.
Mah Sing had bought the land from Panasonic HA Air-Conditioning (M) Sdn Bhd for RM89 million or RM104.23 per sq ft. The deal was completed in March this year. The land is situated at the crossroads of the Lebuhraya Damansara-Puchong and Federal Highway, making it strategic for development. Initial plans for the land were to build three 17-storey serviced apartment buildings, a 16-storey hotel, five blocks of 25- to 31-storey office towers, a 20-storey small office home office block, 18 units of three-and-a-half-storey showrooms and 80 units of four-and-a-half-storey shop lots. However, Mah Sing chief operating officer for commercial projects, Andy Chua, said the development plan for the five-year project is being modified to enhance its appeal. "We are adding some unique and interesting concepts. 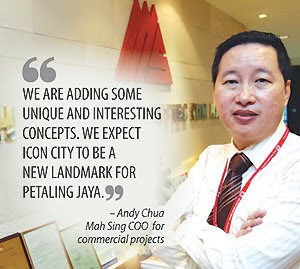 We expect Icon City to be a new landmark for Petaling Jaya," Chua told Business Times. He said Icon City will be a one-of-its-kind green and eco-friendly development with smart features and it will further enhance Malaysia as a property investment destination. Chua added that the office towers will be tailor-made and sold en bloc while the apartments and shoplots will be kept for retail investors. "We are bullish on the project as there is a pent-up demand for commercial properties in Petaling Jaya. Although the market may not be ready, but if the project is unique and special and people see the value of the properties, people will invest. "A lot of companies are also moving to Petaling Jaya as an alternative to having an office in the Kuala Lumpur city centre. The rental yields are good here," he said. Chua said Mah Sing aims to submit its final development plan to the local authorities by the third quarter of this year and start construction immediately. It has started to demolish the Matsushita building and will complete the works by September, he said. The institutional segment of the initial public offering (IPO) of Malaysia's largest real estate investment trust (REIT), Sunway REIT, has been "fully covered" at above RM0.90 a unit, two sources with direct knowledge of the deal said. The roughly US$500 million (RM1,610) IPO, Malaysia's largest so far this year, comes amid a faltering market for new offerings as investors fret about further financial troubles in Europe and its impact on the global economic recovery. The IPO also comes ahead of a host of offerings by national oil corporation Petronas and shipping firm MISC scheduled for the second half of 2010. "The book is fully covered. It's oversubscribed by about 1.2 times now," said one of the sources, who asked not to be named because he is not authorised to speak to the media. "All the local funds are in and we're still getting international orders. It's quite an achievement given the current market conditions," the source said. But Sunway REIT may have to price its IPO at the lower end of its indicated range because of deteriorating market conditions, said the sources. The company last week set the indicative price range for the sale of 1.6 billion units of the REIT at between RM0.90 and RM0.98 per unit. This means the IPO could raise between RM1.44 billion to RM1.57 billion. The global market for IPOs, which had shown signs of a resurgence early in the year, faces a spate of delays and downsizings, underscoring difficulties for mega deals such as Agricultural Bank of China's IPO. Sunway said earlier this month it had secured four cornerstone investors who will take 14 per cent of the IPO. Sunway REIT will have a market capitalisation of RM2.4 billion to RM2.6 billion when it is listed on July 8. SUNWAY Real Estate Investment Trust, controlled by Malaysian property and hotel group Sunway City Bhd, is selling shares at 90 sen each to institutional investors in an initial public offering, according to four people with knowledge of the matter. The price is at the low end of the 90 sen to 98 sen range marketed to investors, said the people who declined to be identified as the details are private. The sale is being managed by a group of banks led by Credit Suisse Group AG and RHB Capital Bhd. The IPO is set to top Masterskill Education Group Bhd’s RM771.4 million sale in May, and underscores rising investor appetite for stocks in the Southeast Asian nation amid an economic rebound from last year’s recession. Sunway REIT will begin trading next month and join 12 other REITs listed on the Kuala Lumpur stock exchange. The Malaysian property trust includes shopping malls and hotels valued at RM3.7 billion, making it the biggest REIT in the country by asset value. Its Sunway Pyramid Shopping Mall is the biggest in Malaysia by net lettable area, according to OSK. More than 70 per cent of Sunway REIT’s income is derived from its retail properties. KUALA LUMPUR: The institutional segment of the initial public offering (IPO) of Malaysia’s largest real estate investment trust, Sunway REIT, had been “fully covered” at above 90 sen a unit, two sources with direct knowledge of the deal said. The roughly US$500mil IPO, Malaysia’s largest so far this year, comes amid a faltering market for new offerings as investors fret about further financial troubles in Europe and its impact on the global economic recovery. The IPO also comes ahead of a host of offerings by Petroliam Nasional Bhd and MISC Bhd, scheduled for the second half of this year. “The book is fully covered. It’s oversubscribed by about 1.2 times now,” said one of the sources, who asked not to be named because he is not authorised to speak to the media. “All the local funds are in and we’re still getting international orders. It’s quite an achievement, given the current market conditions,” the source said. The company last week set the indicative price range for the sale of 1.6 billion units of the REIT at between 90 sen and 98 sen per unit. This means the IPO could raise RM1.44bil to RM1.57bil. The global market for IPOs, which had shown signs of a resurgence early in the year, faces a spate of delays and downsizings, underscoring difficulties for mega deals such as Agricultural Bank of China’s IPO. Sunway said earlier this month it had secured four cornerstone investors who would take 14% of the IPO. Sunway REIT will have a market capitalisation of RM2.4bil to RM2.6bil when it is listed on July 8. The IPO, comprising an institutional tranche of 1.5 billion units, more than 90% of the total, and a retail portion of 134 million units, is expected to be priced on Friday. The REIT will house eight properties, comprising shopping malls, office towers, and hotels with a combined market value of about RM3.7bil. Credit Suisse and RHB Investment Bank are the joint global coordinators of the deal. The banks, along with CIMB, HSBC, JPMorgan and the investment banking arm of Maybank are joint bookrunners. STATE governments are encouraged to share knowledge, experience and expertise among themselves to develop halal parks in their respective states. There are eight halal parks in the country that are doing well, having collectively attracted RM4.8 billion in investment so far. They include Selangor, Negri Sembilan and Malacca. In facilitating the orderly development of halal parks, Halal Development Corp (HDC), an agency under the Minister of International Trade and Industry (Miti) which is responsible to spearhead the development of the local halal industry, has published a HDC Designated Halal Parks guideline. To date, a total of 97 companies have either purchased factory sites, started factory construction or are operating at the various halal parks. "Halal park is a new initiative that has a lot of processes. I won't say the parks that are less developed are failures, they are just relatively new," said Minister Datuk Seri Mustapa Mohamed at the Third World Halal Research Summit 2010 in Kuala Lumpur yesterday. "There should be a correlation between state governments to promote halal parks as well as support each other in the supply chain," he said. Earlier, in his speech, Mustapa said Malaysia has developed the concept of halal parks which are dedicated economic zones with the infrastructure, incentives and support services readily available for potential investors. "We also have the Global Halal Support Centre (GHSC) under HDC, which was established to be a world leader and global reference centre in halal knowledge and halal related services for both investors and consumers. GHSC hopes to be the one-stop centre for companies and service providers in halal-related sectors," he said. Themed "Inspiring Innovation Through Halal Research", this year's summit focuses on encouraging innovation within halal research findings worldwide. It brings together the world's halal players to explore and discuss updates on research findings, emerging technologies, trends, issues and challenges within the halal industry. While other countries are focusing on a certain halal products like halal food, halal meat or poultry, the government aims to develop a halal eco-system in the country. The halal eco-system constitutes the components for a holistic halal supply chain incorporating production, research and development, banking and finance, logistics, tourism and other support services. Work on the LRT extension from the Kelana Jaya line to USJ 20 in Subang Jaya and the Ampang line from Sri Petaling to Taman Puchong Prima will start soon. Syarikat Prasarana Negara Berhad (Prasarana) has been given the approval for both lines from the Department of Railways. There will be 13 stations for each of the two lines. Prasarana group managing director Datuk Idrose Mohamed said they had their public hearing for three months beginning Sept 15 last year. “The proposed lines were displayed at various locations of the local authorities,” Idrose told reporters at his office in Bangsar yesterday. “We received a lot of feedback from the public and stakeholders while meetings were also held with residents on their objections raised. “Both the federal and state governments ordered us to study the objections raised and how we can overcome the issues. We gave solutions and approval was granted,” he said. On the remaining “unapproved” sections, Idrose said discussions were being held with the state and federal governments and hoped to obtain approval soon after all issues and residents’ concerns were sorted out. For the Kelana Jaya line, the first phase of construction work covering 9.2km will be from the Kelana Jaya station to USJ near the Kesas highway. For the Ampang line, the first phase is from the Sri Petaling station to Kinrara 3 covering 7.4km. Work to relocate telecommunication cables, TNB underground cables and high voltage transmission lines, water mains, sewerage and gas pipes is expected to start in mid-July. Idrose said work on both the lines would start simultaneously and was expected to be completed in three years. He said the exact time frame would be clearer once approval for the remaining sections was obtained and tender called in September. He added that there would be 800 to 1,500 parking bays depending on the location of the stations and the ridership. Some stations are being integrated and some with just drop-off bays without the park-and-ride facility.